This post was last updated on Oct. 8, 2015 at 12:17 p.m. ET. Facebook has all the feels -- except for “dislike” -- and it’s finally letting them out. Today the social media giant began testing “Reactions,” a set of emoji-style buttons that people can use to show how they feel about their friends’ status updates. Here’s to fewer moments of awkwardly scrolling past posts you don’t exactly like. On top of the long lonely “like” option, users will also see a thumbs-up button, a heart button and five round emo faces. The emoji’s emotional range is a bit limited, conveying only the feelings “sad” and “angry,” along with “haha,” “yay” and “wow,” whatever those really mean. How will your friends know if you’re throwing Reactions around sarcastically, we wonder? The emojis will be available on all News Feed and Pages posts, on Facebook's web platform and iOS and Android apps. So, yes, “Like” is finally getting some expressive company, mainly because users demanded more response choices and Facebook listened. That’s how the social giant spins it at least. "As you can see, it's not a “dislike” button, though we hope it addresses the spirit of this request more broadly," Facebook’s chief product officer Chris Cox said on his wall today. "We studied which comments and reactions are most commonly and universally expressed across Facebook, then worked to design an experience around them that was elegant and fun." We like the idea of emotive extensions to the good, old "like" button, too, but we’re not getting excited just yet. Why? 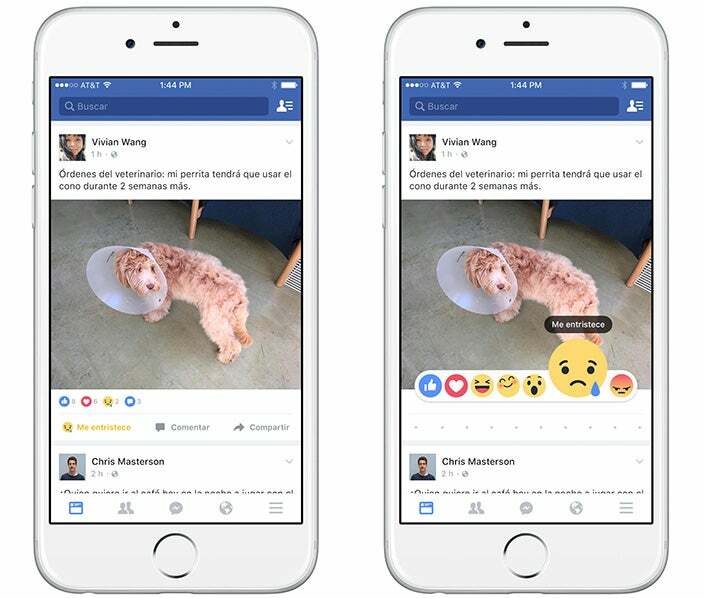 Because only Facebookers in Spain and Ireland are currently testing out Reactions. We asked Facebook when and if the new buttons will roll out stateside, but the company did not answer this question in its response. If you were crossing your fingers for a cranky “dislike” button, it’s the sad face for you. Don’t expect one in the next Facebook update, or possibly ever, despite Mark Zuckerberg saying last month that his company was “working on it and shipping it.” Doodling will have to do for now. Meanwhile, businesses that market on Facebook might not say “yay” to Reactions, as they can’t be disabled, positive or negative ones, “loves,” “wows” and “angry” and “sad” emoji included. They’ll appear on whatever people post, individuals or marketers, for everyone to see. How do you “like” that?